Sea levels, warming of the surface and upper layer of the oceans, greenhouse gases and land temperatures all hit a record high in 2014. In addition to this, glacier melt and tropical storms were also at a high, while sea ice loss continued. These are the findings from the annual State of the Climate report, published in the Bulletin of the American Meteorological Society. The results are based on the work of 413 independent scientists from 58 countries. “This report represents data from around the globe, from hundreds of scientists and gives us a picture of what happened in 2014,” explained Thomas Karl, director of the National Oceanic and Atmospheric Administration who carried out the report, which has been produced every year for the last 25. “The variety of indicators shows us how our climate is changing, not just in temperature but from the depths of the oceans to the outer atmosphere,” he added. The report also hints at something even more worrying. Even if greenhouse gas levels were cut immediately, the researchers claim the warming of the oceans is predicted to continue for centuries and millennia. It seems we might have reached the tipping point, and crashed over the edge. Below are some of the major findings from the State of the Climate in 2014 report. Overall, the global average temperature over land in 2014 was the warmest – or tied as the warmest depending on which data set you use – since records began in the 1880s. The average annual temperature last year was 0.37-0.44oC (0.7-0.79oF) higher than the 1981-2010 average, and 0.88oC (1.6oF) higher than the 1880s. More than 20 countries in Europe set new high-temperature records, with a new record also set for Africa as a continent. The only places that saw average land temperatures drop were the eastern United States, central and southern Canada, and parts of central Asia. 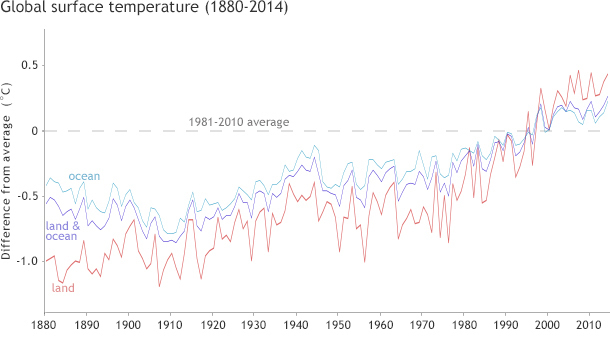 The average sea surface temperature was the highest on record. 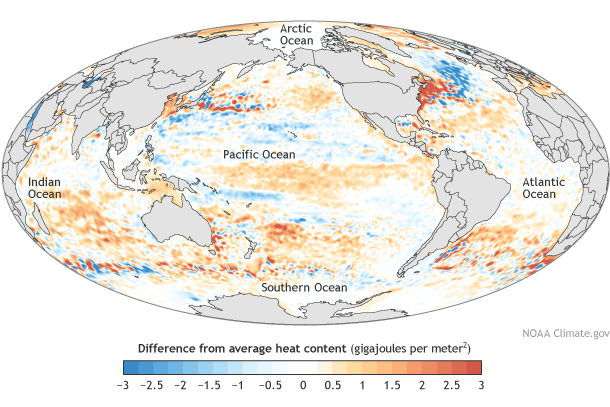 The ocean’s ability to store and release heat is critical to the stabilization of the planet’s climate, and temperatures do fluctuate naturally. But as the average temperature starts to climb, it contributes to rising sea levels, cyclones, and an increase in melting sea ice and glaciers. The new report warns that the warming of the oceans is now unstoppable. Even if we were to cut all carbon emissions tomorrow, the temperature of the world’s oceans will continue to rise for decades, or centuries even. Greenhouse gas emissions – looking primarily at carbon dioxide, methane and nitrous oxide – saw yet another historic high for 2014. Atmospheric CO2 levels reached 397.2 parts per million (ppm), up from 354 ppm when this report was first published 25 years ago in 1990. 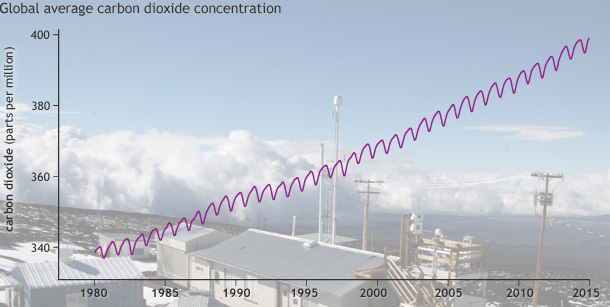 This increase in CO2 levels has been attributed to a fourfold increase in emissions from human activities. 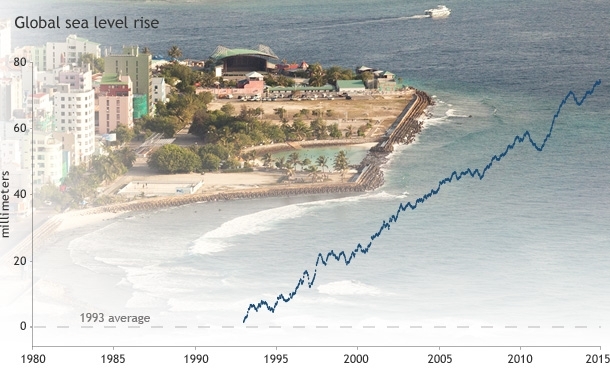 Average global sea level was 6.7 centimeters (2.6 inches) above the 1993 average, which put it at the highest on record. This rise, however, affects different regions disproportionately as sea level rise does not happen uniformly across the whole planet, as it is often affected by shifts in major currents, for example. With almost 40% of people in the United States living in coastal cities, sea level rise, and the increase in cyclones and storms, is set to have a major impact on many people’s lives.